I had the opportunity this week to speed-test my Oakley Studio Websites Production02 cloud-based web server against one of the big commodity website hosting firms. The request came from one of my resellers, who has a client who is concerned about website load times. Her website is currently hosted at Blue Host. This client may be interested in moving her site for other reasons, but page load time is a high priority. To test the identical site on my own server, I used ServerPilot to install a plain-vanilla WordPress test site on Production02. Because the original site uses SSL encryption, I installed a LetsEncrypt SSL digital certificate on my test site. Then I used ManageWP to clone the original site over the test site. Now I had an identical copy of the original site on my Production server. By running performance tests on both sites, nearly all the differences ought to be attributable to differences between the two hosting web servers: Oakley Studio Websites and Blue Host. I ran the same Performance Tests on both the original site and my test site. Here are the results. Not surprisingly, the overall “grades” for performance were identical. 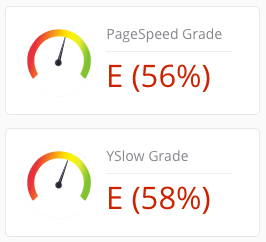 Both sites received an E (56%) PageSpeed Grade, and an E (58%) YSlow Grade. This is on a scale from A (best) to F (worst), which suggests there are plenty of opportunities to improve the performance of this website, irrespective of the server it is being hosted on. Possibly this difference is due to cloning, which may have performed some minimal optimization on files during the cloning process. Our Oakley Studio Production02 server loaded the identical site nearly 20% faster. This last metric is all about how long it takes for DNS to resolve a domain name into an IP address before a web page can start to download. On this measure, Oakley Studio excels with blazing-fast DNS, beating Blue Host by starting page delivery over 82% faster! I have long suspected that separating DNS management from Registrar DNS makes the biggest difference in load times. Most domain name registrars have heavily overloaded DNS servers, and it never occurs to most clients that they could dramatically improve page delivery speed by using a top-tier DNS management service. That hidden optimization is included in all Oakley Studio hosting packages. There are many reasons to love Oakley Studio Websites besides page load times. (Daily security checks/updates, personalized webmaster tech support, concierge domain/site/email management, WordPress coaching/training, staging & production sites, free SSL encryption…) We believe our enforcement of strong passwords and daily security checks will do a better job of keeping our client websites safe from hackers. We believe our coaching, training, and support makes for more educated and capable clients. But if faster page delivery is all you care about, Oakley Studio Websites passes the test and clearly outperforms. Nice writeup Pete. This is going to be helpful in convincing my customer to switch to Oakley Studio for hosting.